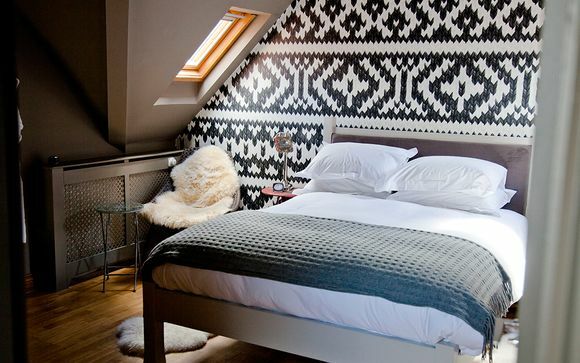 Take a few days out of your busy week to relax and unwind at the White Horse - an award-winning boutique with amazing views and fantastic food. Nestled at the foot of the stunning South Downs, it is easy to explore the beautiful Sussex countryside. Our members can choose from three luxurious room types with a full English Breakfast with an exclusive Sparkling Cream Tea per person per stay. Grab your walking boots and get ready to immerse yourself in fine English countryside. 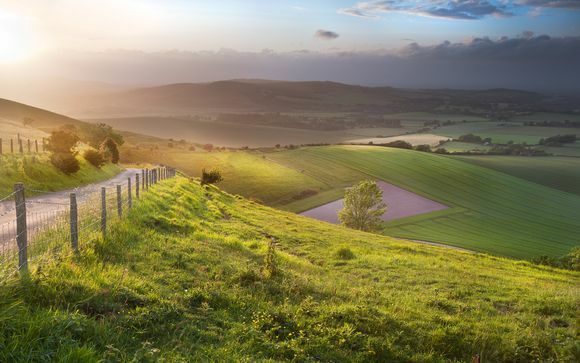 Set in the beautiful South Downs, The White Horse offers the perfect base from which to explore and discover this spectacular National Park on foot. The region’s sloping hills and ancient woodlands has long attracted walkers and ramblers with its promise of incredible landscapes and fascinating wildlife. You must also make sure you take the time to soak in the bustling market towns steeped in history and traditional English culture. Only a few minutes away lies the Goodwood Estate, where you can enjoy a day out golfing, motor racing, horse racing or taking part in their resident flying club. The world-renowned Cowdray Polo Club, Chichester Festival Theatre, and both the Fishbourne Roman Palace and Weald and Downland Museums are also nearby, so you can spend the day immersing yourself in the best of Chichester’s cultural offerings and still be back in time for dinner. 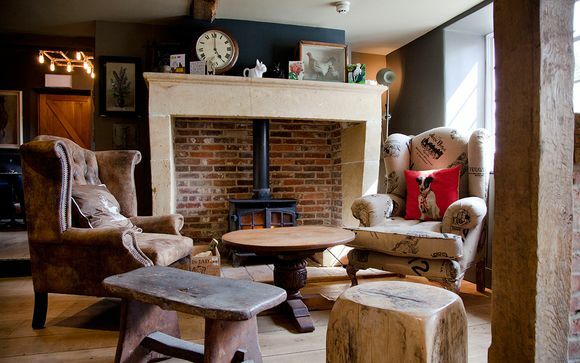 Nestled in foothills of the South Downs, this delightful inn is cleverly tucked away taking full advantage of the peace and tranquility that characterises this corner of the country. The Epicurean Collection handpicks iconic inns that celebrate the beautiful British countryside and provide high-quality service and amazing food and drink. You may choose from a Small Luxury Room with Bath, a Luxury Room with Shower, a Luxury Room with Copper Bath & a Luxury Room with Hot Tub. All the rooms are designed with supreme comfort in mind with double beds draped in luxurious Egyptian cotton and the finest English wool throws. The en-suite bathrooms are a mix of calming rain showers and striking design, complete with handmade soaps and bath oils. 50” televisions and broadband Internet are just some of the lux modern details they've added – and to guarantee that perfect cup of coffee or tea, they deliver a bottle of fresh milk to your door daily. Combining rustic elegance with contemporary design, these spacious rooms reflect our passion for quality and the charm of the countryside. 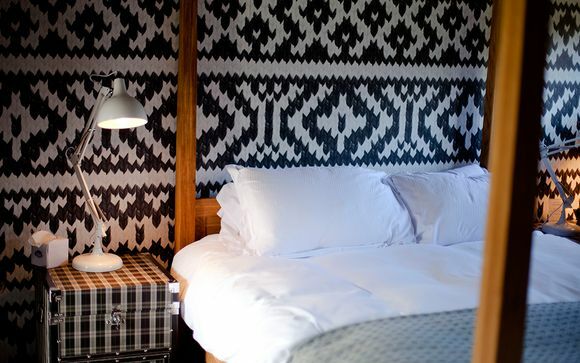 Luxurious steamer trunks, iconic mid-century furnishings and some feature four-poster beds set amidst sheepskin rugs, wool throws and exposed wood beams. 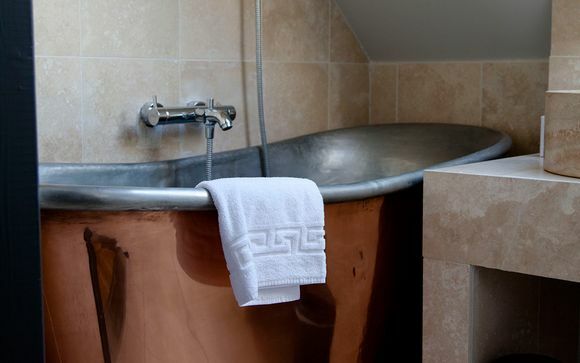 As above, with the added indulgence of a beautiful copper bath to have a long luxurious soak in. Opt for the ultimate luxury with a private hot tub where you can indulge with a relaxing soak. Just for you: 1 x Tinwood Sparkling Cream Tea per person per stay. 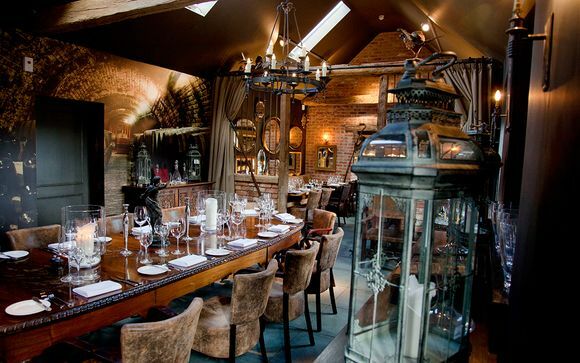 The celebrated and much loved restaurant at the White Horse prides itself on creating menus from the freshest local produce sourced directly from the woodlands, farms and country estates that surround it. All of the game and fish is delivered by local suppliers and friends – from the exquisite venison, straight from the hunt and prepared on site, to the Chilgrove wood pigeons, rabbits and trout, plucked from nearby rivers and fields that morning. You can be sure that every dish has its roots in the beautiful South Downs. Cosy up in The Snug, unwind with a coffee and paper in The Sanctuary or head to the bar for a pint of ale after walking the dog. The wine cellar is brimming with fabulous wines by the bottle or by the glass. For something special, ask to see The Red Book, a handpicked selection of some of the world’s finest wines. From opulent Burgundies to delicate Chardonnays, there is something for every palate to enjoy. 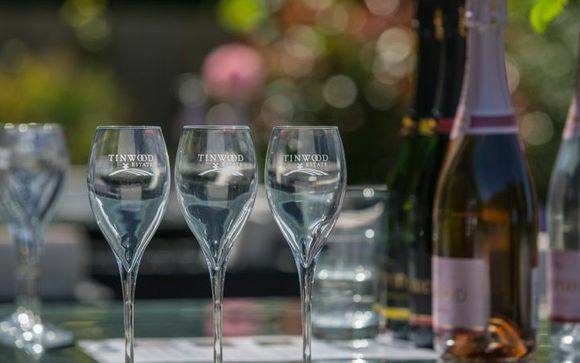 Situated in the heart of West Sussex, at the foot of the South Downs National Park, the Tinwood Estate’s vineyards have established a reputation for producing the very finest English sparkling wines, including The Estate Brut, the Blanc de Blancs and an exquisite Rosé. Tour the grounds, meet the winegrowers and sip the finest offerings in the brand new modern tasting room, overlooking the vines. Take the Festival Theatre exit from the Fire Station one-way system then take the road to Lavant. Follow the signposts to Chilgrove and The White Horse will be on your right. Take the A3 towards Portsmouth through the Hindhead Tunnel and continue for 15 miles. Next take the A272 signposted Petersfield/Midhurst, before turning right onto the road towards Pulens Ln/B2199. At the end of the road take a left and follow for 3 miles before turning right to continue on B2146. Next, take the B2141 and continue your descent into Chilgrove. The White Horse will be on your left. The nearest train station is Chichester which runs regular services to and from London Victoria.